This post is well pressed from Writers in The Storm. Check out this valuable information from Janice Hardy, who shares writing resources on her blog The Other Side of the Story. Decades ago, a detached, omniscient point of view was all the rage. Readers wanted to be told a story, so the stories read as if someone was indeed telling them. That style faded as readers sought a more immersive read, and tight points of view became popular. Regardless of who the narrator is, that’s the person the reader experiences the novel through. A tight first person narrator, an omniscient third, a limited third, it’s all filtered through somebody’s eyes. Sometimes this filter is invisible and the reader doesn’t feel any distance between her and the point of view (POV) character. Other times the filters are obvious and the reader feels the wall between her and the characters. One style looksthrough the eyes of the POV, the other looks at the POV. Filter words distance the reader from the POV character. They remind readers they’re reading, explain things that are obvious, and often lead a writer into telling. Even worse, filter words are frequently found with their passive, telling cousins, pushing the reader even further away. If you’re after a tighter and more immersive POV experience, you might try looking for and eliminating these filter words. The easiest fix is to get rid of words like, saw, heard, felt, knew, watched, and looked. What makes these words feel detached is that they’re explaining that a character saw or heard something, and then the narrative goes right ahead and shows it anyway. POV characters by definition are relaying everything they sense, say, and think. If it’s described, readers know the character experienced it in some way. It’s like saying, I’m going to look at something, and now I’m telling you what I looked at. Lisa wandered through the field and saw three crows sitting on the fence. Their black feathers glistened in the morning sunshine. She heard them caw the way crows do, and watched them take flight and soar across the bright, blue sky. I could hear cars whooshing past. The sound of horns blared against my ears, muffled by the morning fog. It felt cold and clammy, sticking to my skin like a layer of wet cloth. It smelled musty, though I knew fog couldn’t possibly be musty. Notice the extra layer. The character is relaying information in a detached, after the fact, watching-me-do-this tone. There’s a feeling of an outside person describing what the character sees and hears rather than experiencing the same things through that character’s senses. Lisa wandered through the field. Three crows sat on the fence, their black feathers glistening in the morning sunshine. They cawed the way crows do, then took flight and soared across the bright, blue sky. Cars whooshed past, their blaring horns muffled by the morning fog. It lay cold and clammy against my skin like wet cloth. Musty, though fog couldn’t possibly be musty. Now the POV character is describing what they experience without telling the reader that they’re looking or hearing or smelling. The reader feels closer to the POV, and can imagine themselves in the story instead of watching the story from afar. Revising to eliminate filter words is an easy way to achieve a tighter POV, and even fix any told prose in the process. Do you prefer a tight or a distant point of view? Why? What about it captures you as a reader? Janice Hardy always wondered about the darker side of healing. For her fantasy trilogy THE HEALING WARS, she tapped into her own dark side to create a world where healing was dangerous, and those with the best intentions often made the worst choices. Her books include THE SHIFTER, and BLUE FIRE. DARKFALL, from Balzer+Bray/Harper Collins. She lives in Georgia with her husband, three cats and one very nervous freshwater eel. You can visit her online at www.janicehardy.com, chat with her about writing on her blog,The Other Side of the Story, or find her on Twitter @Janice_Hardy. COFFIN HOP is the annual online Horror creator event, geared towards gaining exposure for indie horror and genre authors and artists, while increasing interaction with fans and readers. COFFIN HOP runs October 24-31 atWWW.COFFINHOP.COM and regularly features more than 200 artists and authors, partying it up, bringing the treats and the tricks to an online audience of thousands. The fifth day of the Coffin Hop and a comment gets you entered in the drawing for an ebook copy of Wolfen Secrets. Happy Hopping! The Lady in the Mist is the first book in The Western Werewolf Legend Series. The Civil War took Sonja Brooks’ husband and left her alone. Unprotected and scared, she runs headlong into a life changing event when she’s attacked by a pack of wolves. Her fate as a werewolf is sealed. When she stumbles upon Ty Loflin, a Rebel soldier dying of his wounds, she nurses him back to health. He’s the perfect mate, but will he want her once he knows the truth? Click on the picture for a free sample of The Lady in the Mist. Wolfen Secrets released a couple of weeks ago to all the major outlets. Today I want to share an excerpt from the third book in The Western Werewolf Legend series. First, I’ll share the book blurb. Click on the picture of the cover to purchase your copy at Amazon. Wolfen Secrets (The Western Werewolf Legend #3) Not only do our dreams hold secrets to our future, but as Sonja Brooks discovers they also hold the keys to immense danger for her kind. Sonja finds the western werewolf pack in great peril when she and her mate, Tyler Loflin have to take on the vampires and their undead magic. When confronted with vampires that won’t ever die, Tyler Loflin has to formalize a plan to protect the woman he loves as well as the men who are like brothers to him. The only problem is keeping the plan a secret from Sonja, who is the alpha she-wolf of their pack. Sonja Brooks’ body jerked, waking with a jolt. She’d been dreaming again. Running trembling fingers through her hair, she released an unsteady breath. The darkness was always filled with hands clawing at her flesh, moans of anguish or sharp stabs of pain. Being a werewolf had brought all kinds of changes to her life. This latest plague was the worst. Depending on an ordered, tidy existence was a thing of the past. Would she ever be able to sleep without nightmares or rest peacefully again? Her mentor, the witch, Hortence, had given her potion after potion to relieve the restless nights of dream after unsettling dream. None had helped. So, the night sweats and visions continued like premonitions from a horror play. Her hands came down, punching the quilt on either side of her thighs in an act of frustration. Immediately, Ty’s arm came around her. Her lover, Tyler Loflin, wrapped her close. “Easy, Sonja! Baby, I’m right here.” His strength – so solid and dependable along with his words – so warm and gentle enveloped her. Nothing could penetrate his protection, nothing, she mused. Sonja wrapped her arms around his solid strength, languishing in his hold. “Are you okay?” “Yes… the dream…I had it again.” Seeking the crook of his neck as a haven, Sonja released a shaky breath. Ty’s heart beat in solid, rhythmic cadence. His long, dark hair skimmed her cheek in a soft caress. “Here, now, let me hold you. You can tell me what happened.” With big, bronzed hands, he adjusted the covers, arranging a nest of sorts for her comfort. “Shamans say it makes a bad dream better when you talk about the fool thing.” Ty punched up the pillows. Easing her back, he made sure she was comfortable before joining her against the cool cotton. In a gesture as old as time, he reached out, brushing her curls back from her face. “Now, that’s better?” She let out a slow breath. It was worth a try. Nodding, she frowned, trying to recall the details. “It’s the same one I keep having. We are fighting the vampires. There are so many!” Her voice cracked with the last words. She swallowed hard. The tears couldn’t break free. “I got you, Nymph. You’re safe. Nothing will hurt you, now. Keep going.” Sonja sniffed before sending him a trembling smile. She loved it when he used the pet name he’d given her right after they’d met over three months before. “All right.” Shoving at her hair, she tried again. “This time, the bloodsuckers are everywhere. They’re coming out of the woodwork, Ty.” She glanced at him, the fingers of unease showing again. “There’s so many, I don’t think we will stop them.” He patted her back gentle like, rocking her slightly in his hold. “Just a dream, it’s okay, I got you.” “We’re separated.” She slid her hand between their bodies, wiping at the tears. “I can’t see you, yet I hear you. You’re swarmed by vampires.” Panic clawed at her chest. She clutched at her breast, the pressure there cutting off her air. On a strangled cry, Sonja shoved away. Suddenly, his comfort had turned into a vice-like sensation. “I…I can’t breathe, Ty!” He released her, rolling from the bed, before, reaching for her to follow. Sonja went immediately into his hold. “Watch me, Nymph – breathe,” he commanded. “Breathe…that’s it. Now again…deep. Let it out slow. That’s a girl.” He raised her arms up over her head, standing with her until her chest eased its rapid constriction. With his big hand, Ty gently rubbed between her breasts. “Feel better?” She nodded. Soon, the feeling of security his hold invoked returned. The anxiety attack eased. Threading her arms around him, she smiled when his sturdy embrace encircled her once more. “I’ll speak to Hortence again about the damn nightmares. There has to be a better way to handle them.” “Do you suppose they’re more than figments of my imagination?” A frown crossed her brow. Was it possible for someone or something else to hold control over her nightmares? “Like a vampire spell or perhaps black magic?” She leaned back in his hold, gazing steadily into his eyes. “We may not be considering all the possibilities, Ty.” “It’s not off to consider the vampires have powers too – maybe even access to magic.” Ty shook his head before resting his brow against hers. “We know so little about these damn creatures of the night. It frustrates the hell out of me. So, somehow they get inside your head, conjuring up a wicked dream.” Gathering her close again, he tried to reassure. “Tomorrow we’ll talk to Hortence. She’s got to have something that will block the dreams. I won’t give up until I find one. I promise, Nymph.” Resting against his chest, the vibration of his voice next to her ear as a welcome balm, Sonja closed her eyes. Could the dreams be her anxiety manifested or the future about to play out in reality? God, she hoped not! Unable to stop her body’s cringe, the memory of the screams came back to her. In the dream, Ty needed her help, yet she wasn’t able to reach him in time. First of all, i want to thank the authors who donated goodies for the Wolfen Secrets Release Rafflecopter Giveaway. Sharon Hamilton, Ally Thomas and Alexandra Anthony. Thank you, ladies for your support! 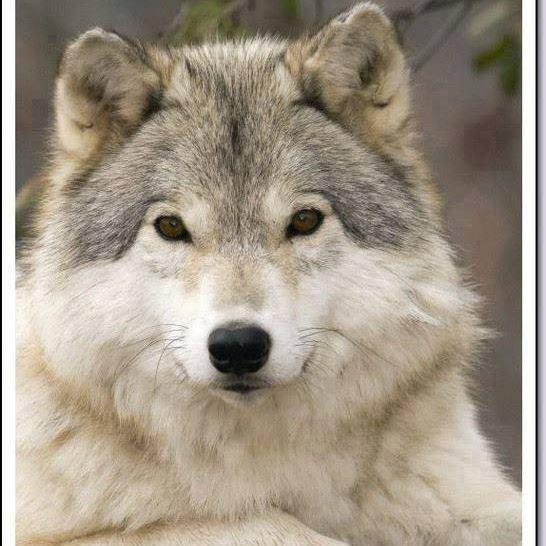 Now, the moment you’ve been waiting for – the winner of the Wolfen Secrets Rafflecopter giveaway is Risha Crider! She’ll receive a package including a signed paperback of The Lady in the Mist, The Western Werewolf Legend # 1, a Catherine Wolffe t-shirt, an autographed poster of Jimmy Thomas and a book by Sharon Hamilton as well as book marks/swag from me, Ally Thomas, Sharon Hamilton and Alexandra Anthony. Also, I’d like to congratulate Linda Bass! 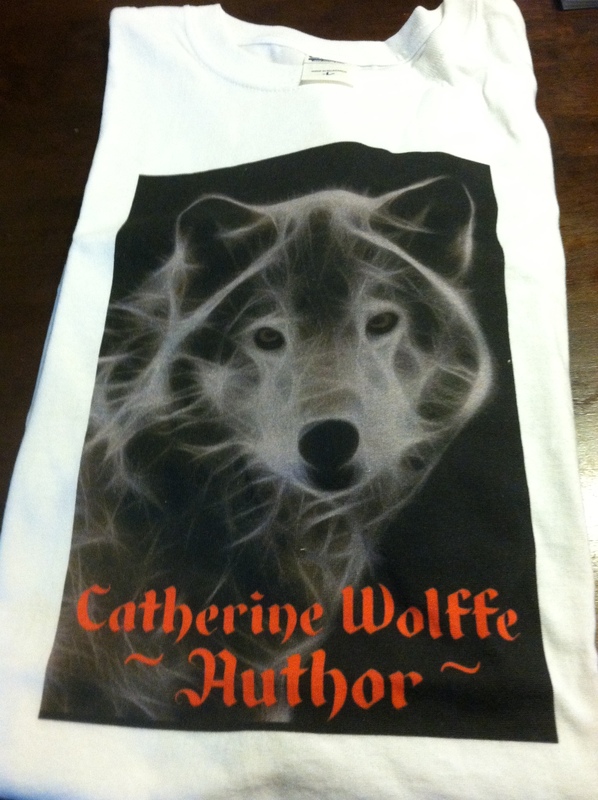 She won a Catherine Wolffe t-shirt and swag as the winner of the Wolfen Secrets Cover Reveal Rafflecopter Giveaway. Thanks to everyone who participated and made the release of Wolfen Secrets such a success. As an indie author, I ask you to share when you can. Thank you for your continued support. Two more days means two more chances to win! Don’t miss out!